One of the primary goals of any local government is to ensure a safe environment for residents. We even take special steps to protect our vulnerable residents whether they are elderly, young, disabled, or just simply need extra help. To do this we invest in first responders that come to the aid of our residents in need. These calls for assistance have historically been just that, manually initiated phone calls. In the past decade the rise of wifi-enabled sensors and broadband have replaced manual alerts with automated calls to dispatchers. This is an often overlooked chasm in the digital divide. Until now this extra level of safety was only available to those who were able to afford it. It would not be feasible for the government to provide connected safety alerts in the homes of individual residents without unsustainable cost, until now. The SCALE network will demonstrate our ability to extend a connected safe home to everyone at a low incremental cost. Using advanced sensor and receiving technology, an elderly, home-bound resident would no longer need to fear a fall. Families would no longer fall victim to a smoke detector with a dead battery. 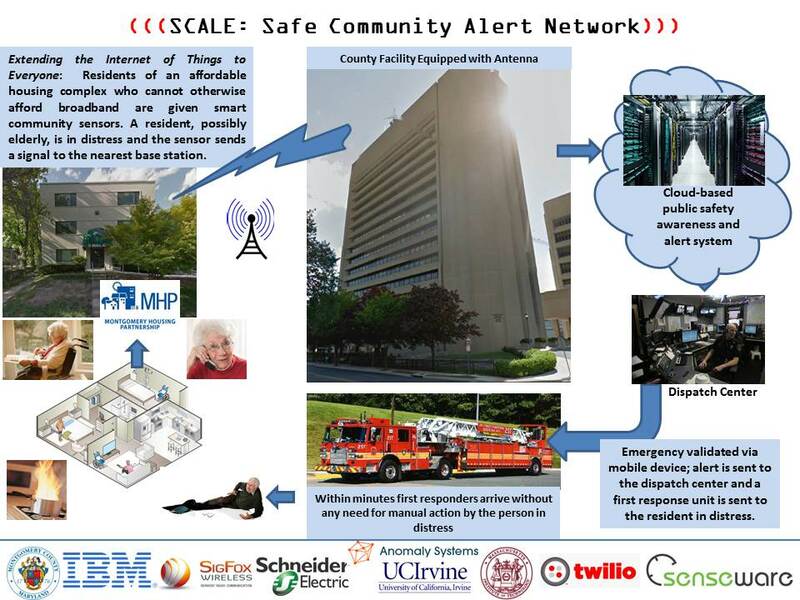 Using a variety of connection methods, including ultra narrow band and mesh networks, SCALE will show that the public sector can create an automated safety alert and community awareness network that protects vulnerable populations. This network does not rely on the resident’s ability to pay for broadband or even require them to have a land line. Sensors can be deployed and connected to first responders thus creating a safer environment for residents and economic opportunity for businesses that might build, deploy, and maintain these devices.